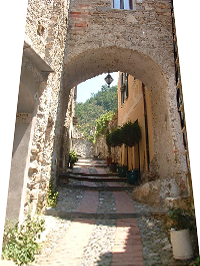 DOLCEACQUA is a pretty town in Imperia province, in the hinterland of the west Liguria. It has about 2000 residents and it is crossed by the Nervia creek, naming the wide valley. 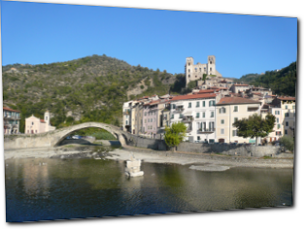 It stretches at the feet of the Ligurian Alps, about 15 km far from the French border and 50 km from the airport. 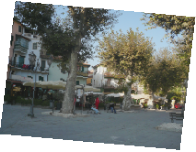 A few minutes far, Pigna thermal baths, other ancient villages, the sea and why not, a little shopping in Bordighera and Sanremo boutiques. Principato di Monaco with its casinos, is close at hand. This lovely medieval town of the extreme Ligurian west is characteristic for the Ponte Vecchio (old bridge) enchanting with its thin span even the painter Claude Monet who, in 1884, made it the subject of different paintings, and for Doria’s Castle now restored and location for summer events. The “TERA”, the oldest side (XI-XII cent.) 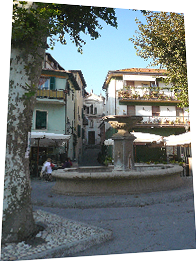 develops in a maze of houses and small streets, the “caruggi”, taking the visitor back to the past and it is dominated by the remains of the magnificent “CASTLE OF DORIA”. It is connected to the more recent part, named “BORGO”, with historical centre too, by the PONTE VECCHIO (old bridge) immortalized by the impressionist Claude Monet in a painting at the Marmottan Museum in Paris. 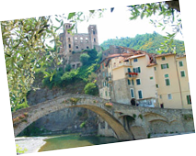 Apart from its beauty, this village is famous also for its DOC wine, named “ROSSESE DI DOLCEACQUA”, produced in small quantities. Dolceacqua is 7 km far from the seaside, the closest beach is Camporosso Mare, “blue flag”. Pigna thermae are 12 km far, an imposing plant/place where, apart from the treatments, it is possible to spend pleasant moments in a beauty farm. Two casinos are available in a distance of 25 km for people fond of society life: the Casino in Montecarlo and the one in Sanremo. People keen on nature can relax making excursions of different kinds. 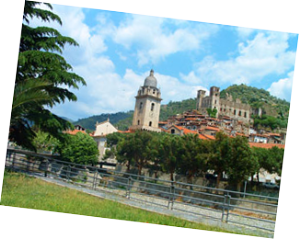 Other activities: tennis, five-a-side football, riding, mountain bike, fishing, canyoning (Rocchetta Nervina), golf (Sanremo). Even the services are numerous: banks, bars, cinemas, restaurants, laundries, the library, shops.